So the monsoons are finally here – it’s a season best enjoyed away from the chaos, mud and puddles of the city. So pack your bags and take a weekend break at these resorts around Kolkata. With rooms priced as low as INR 3,700 per night for two adults, this is an attractive deal. And you’ll have everything you need – from a TV, fridge and AC to mini-bar, study table and coffee maker. And Jamshedpur is hardly a five-and-a-half hour drive from Kolkata. The best part? The scenic Dalma Wildlife Sanctuary! Make sure you pack boots, backpack and bug spray if you are going to visit it or head out for various treks nearby. Thirteen hours from Kolkata lies one of the gateways to Bhutan – Dooars with sweeping green hills, rivers and streams. Check into Sinclairs Retreat at Chalsa Hills overlooking the valley. There are three well-known wildlife sanctuaries nearby – Jaldapara, Gorumara, and Neora Valley National Park. You can also check out the monastery at Lepcha village. And just chill at the hotel – go swimming pool in the pool, play some snooker in the gaming room, browse their library, brush up on your racket skills on the badminton and tennis courts, or get some R&R at the massage or Ayurveda centre, and sauna and steam rooms. You can explore the area on wheels – they rent out cycles. Stay walking distance from the beach at Anutri Beach Resort in Madarmani just four-and-a-half hours away from Kolkata. For INR 5,300 a night for two adults (including breakfast), you can avail of a jacuzzi, swimming pool with a bar, spa, a gym, children’s park and gaming room. Not all of the rooms are tastefully done, so specifically ask for a Sapphire premium room (with a balcony) to enjoy the best stay. Just seven-and-a-half hours away from Kolkata, Odisha’s rich heritage and culture is awaiting your arrival. Starting at INR 5,600 per night for two adults, Hotel Swosti Premium in Bhubaneswar will ensure you have a very comfortable and luxurious stay, with spacious, contemporary rooms and five dining options at your disposal, in addition to a gym, dance floor, swimming pool, Kerala massages and Scottish-theme bar. There’s a bakery as well, to satisfy all your sugar cravings. Plan on visiting Lingaraj Temple, Udayagiri and Khandagiri Caves and Chausathi Jogini Mandir. And, if you have more time, you can venture out to the gorgeous beaches of Puri and swing by the majestic Konark Sun Temple. Loads of siesta time, leisurely laps in the pool, delicious home-cooked meals and gorgeous rooms to have a pajama party in. Sounds like the perfect weekend getaway with the squad? 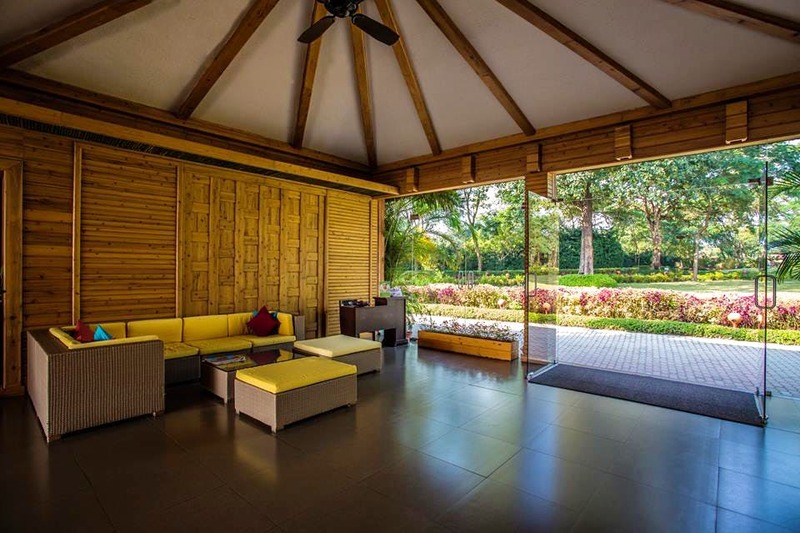 Book a whole villa at Mayas – a resort near Shantiniketan. You will love the splendid cabanas by the pool, and the large lawn. Situated in the heart of Birbhum, near Shantiniketan, the place has 12 bedrooms and can accommodate 16+ guests. It’s reasonable when you split the price between your gang. You get the luxury you crave for and it makes for a perfect, memorable holiday with friends. You can book rooms on their website here.